Panasonic’s excellent HDC-TM300 delivers some of the best still and video images we’ve seen from a small standard-sized HD camcorder. The HDC-TM300, which stores video on both an internal flash drive and an SDHC card, provides robust and innovative features that justify the camera’s relatively high price. Three 1/4.1-inch CMOS chips capture images that the camera encodes as 1080i (at 60 interlaced frames per second) or 1080p (at 24 progressive frames per second) AVCHD files with a maximum data rate of 17 mbps. The camera has 32GB of built-in flash memory, and it supports SDHC cards (you need to supply one yourself). In our lab’s subjective evaluations, the HDC-TM300’s image quality slightly trailed that of the category-leading Canon Vixia HF S10 ( ). The narrow image-quality gap is impressive considering that Panasonic caps the HDC-TM300’s maximum data rate far below the AVCHD format’s (and the HF S10’s) 24-mbps limit. Even with the 17-mbps limit, the HDC-TM300’s video exhibits impressive resolution, smooth motion, accurate color, and low noise. Under standard indoor lighting, the HDC-TM300 earned a score of Good. Under low light, the HDC-TM300 didn’t sacrifice a clean image to preserve smooth motion (or vice versa), a compromise that some other camcorders make. Even so, its low-light video results were in line with those of the competition, and it earned a low-light imaging score of Fair. The camcorder also boasts 5.1-channel Dolby Digital surround sound, which it captures with a cluster of built-in mics mounted on the top. Audio capture was decent; more than adequate for casual shooters, but in the middle of the pack among the camcorders we tested. Still, our lab’s jury evaluations resulted in an audio-quality score of Good. In case you want to shoot still photos in addition to your footage, the HDC-TM300 also excels in that regard. The camcorder shoots 10.6-megapixel stills, and extremely sharp ones at that. In still-image quality, the HDC-TM300 was among the best in we’ve seen, exhibiting sharp, undistorted photos with reasonably accurate color and exposure. The HDC-TM300 netted an overall still-imaging score of Good. 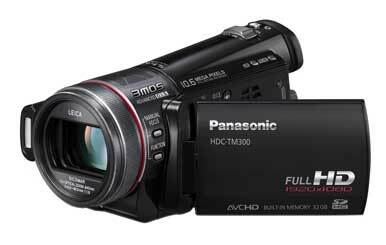 Like previous Panasonic HD camcorders, the HDC-TM300 allows detailed manual control of attributes such as focus, shutter speed, gain, color, and sharpness. The zebra and histogram features provide visual feedback that helps users dial in the best possible exposure. Experienced videographers will appreciate the clear viewfinder (an increasingly rare feature), the microphone and headphone jacks (no hot shoe, though), and the lens-ring control of camera settings. All users will like the 12X-optical-zoom Leica lens, which has very good optical image stabilization. Casual shooters (and experts in a hurry) will benefit from the unique Intelligent Auto (iA) features, which reach beyond standard automated control of focus, white balance, and the like. The iA settings automatically select the most appropriate scene file (portrait, low light, night scenery), optimize contrast, and improve skin colors. Most impressive is the HDC-TM300’s AF Tracking feature: After you select a subject by touching its image on the LCD screen, the camera tracks the subject as it moves, keeping it in focus and well exposed for the length of the shot. The feature doesn’t work perfectly in every situation (such as when a subject briefly moves out of the frame), but AF Tracking is surprisingly effective in many situations. The camcorder does have some minor issues, however. The 2.7-inch LCD touchscreen, while a great control interface for casual users, can become obscured by fingerprint smudges, and thus hard to view under bright sunlight. The camera lacks a mode for taking 30 progressive frames per second, which would have been extremely helpful for Web-bound productions and the YouTube crowd. And the bundled HD Writer AE software is for Windows only, though you can use the video clips in iMovie ‘09 or Final Cut Pro. Beyond those minor complaints (and they are indeed minor) the HDC-TM300 is one of the better small HD camcorders we’ve seen. Its marquee features are its performance in well-lit conditions, its blend of automated and manual modes, and its still-image quality.